As he arrives in Israel, the focus for Pope Benedict XVI shifts from Catholic/Muslim ties, which were at the heart of his three-day visit to Jordan, to relations with Judaism. 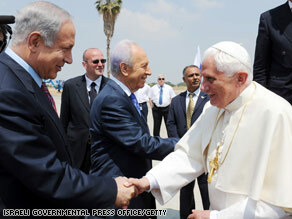 Despite that turbulence, in many ways Benedict XVI appears deeply committed to Catholic/Jewish ties. Prior to his election as pope, he made a speech in Jerusalem in 1994 in which he insisted that Christianity “doesn’t make sense” without Judaism. In his first book as pope, Jesus of Nazareth, Benedict dwelt at length on the Jewish roots of Christianity. The challenge facing Benedict in Israel is thus to lay out a logic for making ties with Jews and with Judaism a top priority for the Catholic Church, in a way that will survive the generational, demographic, and political transitions sketched above. It’s a tall order, and the clock is ticking.